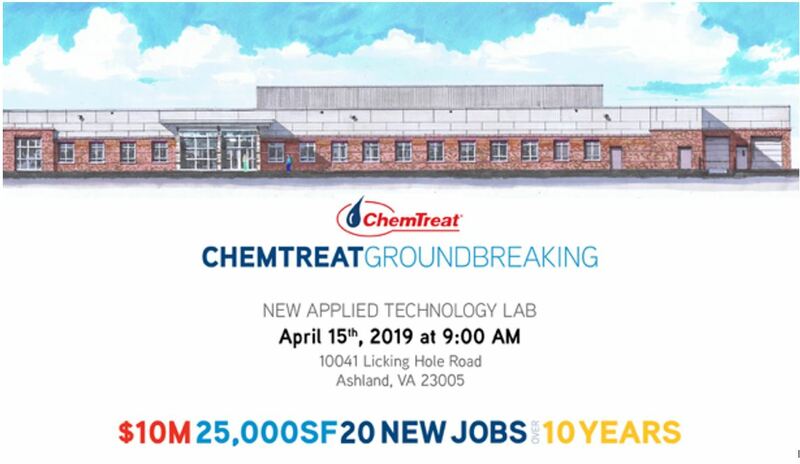 ChemTreat, Inc. will break ground on a new applied technology laboratory in Ashland, Virginia on Monday, April 15, 2019 at 9:00 a.m. This 25,000-square-foot facility will be built across the street from an existing ChemTreat manufacturing plant in the Hanover County Airpark. Construction is anticipated to take approximately one year, and the work will be undertaken by Century Construction. The new facility will help create up to 20 new jobs over the next 10 years. This laboratory will provide advanced capabilities to support ChemTreat’s global base of industrial water treatment customers with industry-leading water analysis. It will also feature state-of-the-art research and development facilities to enable ChemTreat to develop new technologies and solutions for its customers in both the industrial water treatment and oil and gas sectors. ChemTreat recently celebrated its 50th anniversary. Incorporated in 1968 by Harrison R. Tyler and William P. Simmons, ChemTreat is headquartered in Richmond, Virginia and has manufacturing facilities across the United States. Its field representatives provide industrial water treatment chemical sales and related services throughout North and South America. Employing over 2,000 people, ChemTreat has grown to become a leader in the water treatment industry and is committed to continued growth. Its proprietary solutions help customers reduce their water, chemical, and energy costs, extend their asset life, improve their process operations, and reduce their downtime. ChemTreat has water treatment expertise in a variety of industries, from automotive, power, and paper to mining, fuel processing, and commercial and institutional facilities such as data centers and government buildings. The laboratory represents a $10-million investment in ChemTreat’s continued expansion.